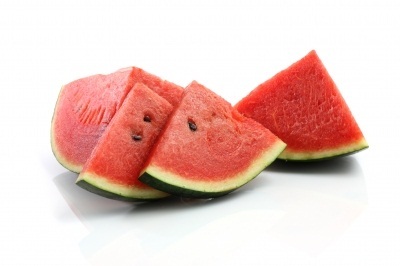 And not only does watermelon taste good, but it has a number of great nutritional properties. Watermelon can help prevent dehydration during the hot summer months with its 93% water content, and it’s a good source of vitamins, minerals & lycopene. While I love watermelon on its own, sometimes the fruit is so big, it’s hard for our family to eat it all before it begins to go bad. So, we’ve included here some great watermelon recipes – no more excuses for letting that leftover watermelon end up in the compost! Here, Southern Living gives us 15 recipes that use watermelon – and there’s something that just about everyone would like on this list, from salsas to salads, garnishes to drinks, and even sorbets. Looking too add a fun twist to your watermelon? Try this Watermelon Martini recipe from All Recipes.com. Food Network.com boasts over 225 watermelon recipes, but the one that caught my eye was this Arugula, Watermelon & Feta salad. Delish! Want to know even more about Watermelon? Check out the National Watermelon Promotion Board’s website. With hundreds of recipes, watermelon carving tips, health & nutrition information and more – this may be the best single source for everything watermelon.